This charming, and let’s be honest, charming it certainly is, describes this truly lovely little plant. Bush green lobed green leaves form underneath almost cupping the delicate little pom-pom like flowers. But don’t let the delicate flowers fool you into thinking they need protection; these are one of the toughest little annual plants Vale’s Greenhouse sells. Able to withstand late spring frosts or the early fall freeze, these happy plants will bloom from the day you plant them until the snow covers them up. Not to worry about pulling them out at the end of the season, even though we sell them as annuals they can be perennial here in Zone 2, and a large percentage of them pop back to life after the snow leaves for the spring. Truly a shade lover, the flowers will last for days after they open. They need to be deadheaded to keep the plant looking tidy. If you have a shady moist area this is the plant for you. 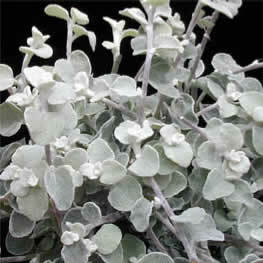 A very attractive basket stuffing plant with downy circular silvery-grey leaves that appear on stems that can grow up to 2 feet long, and sometimes longer. Because of the subdued leaf colour and spreading habit, carefree licorice plants fill many job descriptions. They’re ideal for window boxes, containers and hanging baskets. When grown with other plants, they interweave nicely, and they look stunning beside blue flowering plants such as blue petunias and trailing verbena. Why this plant was nicknamed the licorice plant is a mystery, because it neither smells nor looks like licorice. Fancy foliage is the main attraction, as it rarely flowers. But who needs flowers when the plant has soft, felt-textured leaves that beg to be touched? Licorice plants grow best when shaded from the noonday sun. For best results, water the plants regularly, especially when their roots are confined in a container. If plants go into a serious wilt, the leaves often brown and shrivel. But even if a plant appears to have perished, don't give it up entirely; it will make new growth again if you continue to care for it. Water as needed to keep the soil moist, and take a few minutes now and then to pick off brown leaves. They do not fall away on their own. At the end of the growing season leave the, by now, large plants in the container as they make excellent winter foliage for the winter container. Whether you purchase the Wire Vine, Muehlenbeckia as an indoor houseplant or as a container spiller, you won't be disappointed. 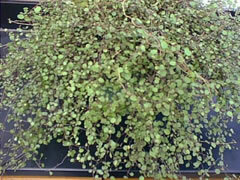 This plant forms a spreading mat of wiry stems, clothed in tiny rounded leaves with a glossy green finish. Muehlenbeckia also known as creeping Wire Vine, is a member of the Polygonaceae family, and is a relative of buckwheat and rhubarb, a strange fact for sure, as this plant resembles none of these. Wavy stems of bronze-red can grow extremely fast, twining around anything it can grasp onto. At Vale’s Greenhouse we recommend that you plant Muehlenbeckia in a hanging basket or container to spill over the edge and droop down the side of the container softening the planting. These plants loves to grow in filtered light or a shady spot and can be mixed with fuchsia, begonias and becopa, but don’t let your imagination stop. you from using this little plant. The stems can be trained to travel up a trellis, but in truth they would much prefer to hang down. The shiny green leaves can withstand a hard frost in the fall, as like myself, many people forget to dig it out and replant it into another pot to bring it into a sunny room for the winter months. 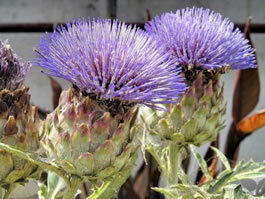 Though technically a perennial, Globe Artichoke is also an attractive plant for its bright floral display,of large violet purple fuzzy flowers sourrounded by large silver serrated spear-like leaves. Originating from the Mediterranean region, the artichoke has been cultivated since the 9th century. These days artichokes are cultivated all over the world as a food source, “who doesn’t like artichoke dip”. But in reality, in Alberta you will grow this plant in a container. The normally edible flowers sit high on sturdy stems and will be a conversation piece, and anyone who dares ask “when you are going to cut them to eat,” will be give the “evil eye”. Editable fruits will be then let to go to seed, which is when the stunning lavender purple thistle-like flower emerges. The large smooth silver leaves make excellent cut foliage for a flower arrangement, but be warned don’t pick too many as the leaves are needed to feed the vigorous growth. You can almost watch this plant spring up to a height of about 36 inches. Grown best in a full sun location, with lots of water and fertilizer you will be amazed how many large green globes will be produced in one season. The nearly succulent-looking green leaves with creamy-white edges make this annual broadleaf evergreen shrub a delight even when not in flower. The purple-violet blooms are set off very strikingly against the variegated leaves, and bloom all summer. It never sulks when you first transplant it into your container, and does not complain too much when it is too dry or to wet. Hebes have almost unlimited uses in the sunny container. They mix in beautifully with everything from the Red Geraniums to the pink petunia and everything in between. A native shrub in New Zealand it can get 4 feet high, but in Alberta once planted for the summer it will not grow a huge amount, instead it will choose to produce masses of pretty spiky blooms. Once planted in a container Hebe’s in general would prefer to be in full sunlight but they will grow well in filtered light. 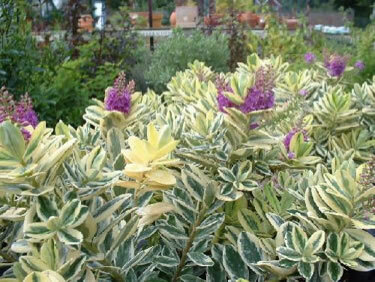 However they will lose some of their variegation and they will not bloom, this does not make them less attractive as they can be mixed with Muehlenbeckia and Fuchsia Gartenmeister for a great display in the shade. At Vale’s Greenhouse we sell several different Hebes and you should check out the other varieties to add whimsy to your containers. So how did a Red Geranium get on the list? “Katrina is going soft,” she caved under this ones beauty. By crossing various species of ivy geraniums (most commonly used in hanging baskets) and zonal geraniums (most commonly found in pots), Syngenta Flowers has bred the best features of both varieties into a single series of geranium. Deep, velvet red coloured flowers stand on taller stems with large fleshy, smooth, ivy-like leaves. They spread out more than regular zonals but don’t quite trail like ivies. In Greek mythology, Calliope herself was the eldest and most distinguished of the nine Muses. She was the Muse of eloquence and epic or heroic poetry. Calliope means "beautiful voice" This one-of-a-kind geranium boasts exceptional heat tolerance to last through those summer scorchers, and will perform well in the cool summer nights. A vigorous mounding habit will quickly fill the hanging basket, or patio container. 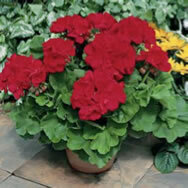 Calliope Geraniums love to be planted in the sun but will perform well in filtered light. 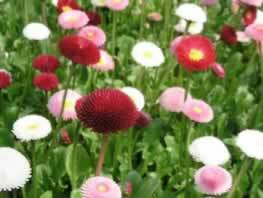 Remove spent flower heads to promote new blooms and fertilize once a week with 20-20-20 fertilizer for healthy plants. If this geranium is planted in deep shade it will no longer bloom and the leaves will grow pale green. This can be fixed in just several days by moving the Geranium to the sun and it will recover and produce masses of blooms.